We're Awakening! : Another free show (99x); Switchfoot in the studio tracking "Vice Verses" tunes! Another free show (99x); Switchfoot in the studio tracking "Vice Verses" tunes! Switchfoot has had a great year running through the alternative radio circuit, and the abundance of Christmas event show appearances for the band is proof. Already slated to play 91x's Wrex the Halls, KROQ's Almost Acoustic Christmas and a couple of shows in the Florida area, Switchfoot just announced another show. 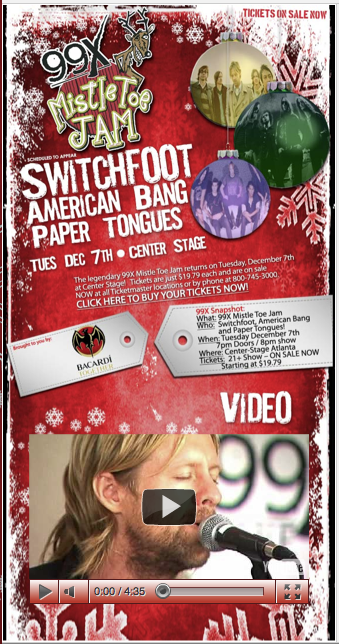 99x in Atlanta, GA revealed that Switchfoot will be performing with American Bang and Paper Tongues at the Mistle Toe Jam 2010. For details and more, click here. For a fourth night in a row, Switchfoot's "Bullet Soul" won San Diego Sophie's challenge. It goes for a fifth straight win tonight against Edward Sharpe & The Magnetic Zeroes. Let's send another win Switchfoot's way! Anyone aching for some new album news will be glad to know the guys were in the studio yesterday tracking for "Vice Verses!" And lastly, it'd be really great if you could send some votes Switchfoot's way for this year's Gospel Music Channel's Top 10 videos of 2010 countdown. "Mess of Me" and "The Sound" are both up for voting. To focus our efforts, let's vote for "The Sound," as it is the newer of the two videos.